Before you get in your car on Monday morning, ask yourself this: Are you looking forward to your commute? Get yourself a BV and you will. Twist the throttle and traffic disappears behind you. The BV 350’s innovative technology provides agility, efficiency and riding pleasure at the highest levels. The BV 350 features a state-of-the-art, single cylinder 350cc engine. 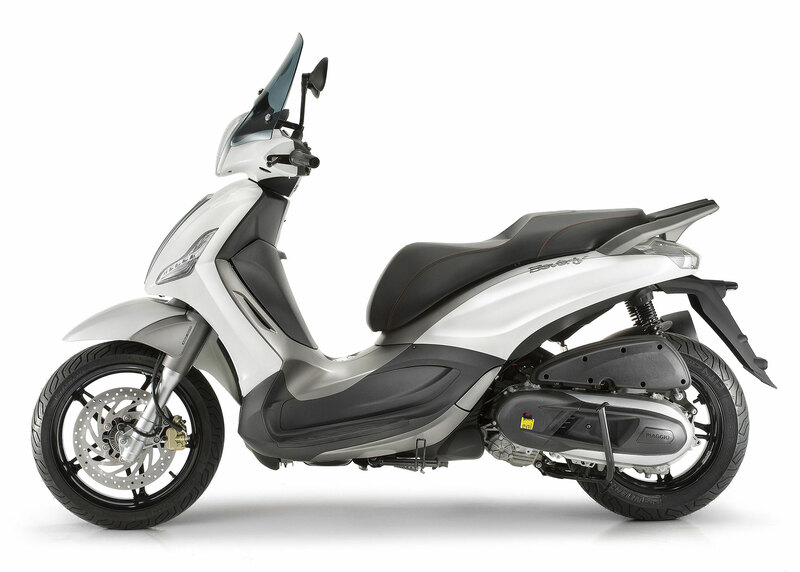 With the power of a 400cc and the compact dimensions and light weight of a 300cc, the BV 350 sets a new standard in the maxi-scooter segment, making it the most powerful scooter in its class. The BV 350 is complimented with Italian design and the highest attention to detail and finishing. Piaggio Beverly SportTouring is the sportiest version of the esteemed family of high-wheel scooters. 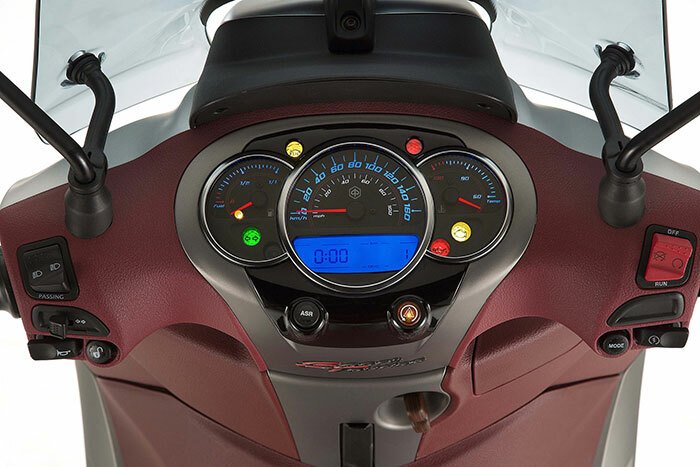 Thanks to the motorcycle-type chassis, the outstanding performance of its 350 engine, the ABS braking system and ASR traction control as standard, the Beverly SportTouring is the most advanced and modern representative of the high-wheel scooter segment. 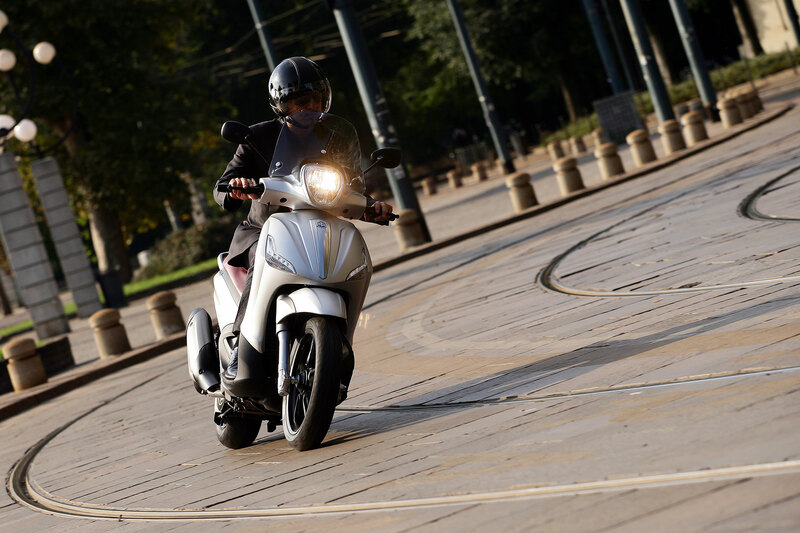 The sporty and advanced version of Beverly, the best-seller of Piaggio high-wheel scooters, among the unequivocal market leaders, is called SportTouring. 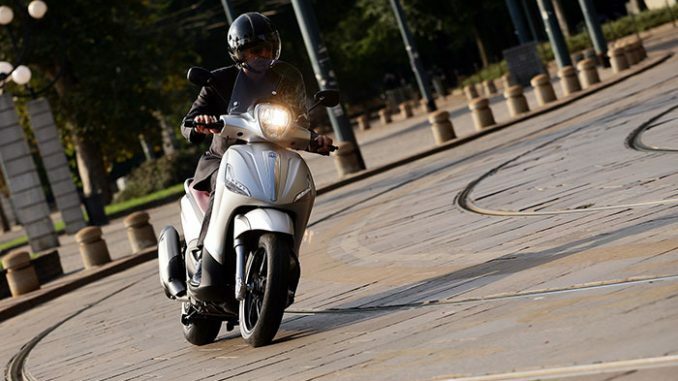 Piaggio Beverly SportTouring stands out for its one of a kind balance between excellent performance as city commuter paired with performance, comfort and motorcycle pleasure of driving. The new Beverly SportTouring is the first scooter on the market which can be equipped with the ABS/ASR package for optimum vehicle management even in the most delicate situations, such as in the event of a sudden loss of grip in emergency acceleration or braking. Both the wheels are equipped with a tone wheel and a sensor for instantaneous detection of rotation speed. The sensors are connected to a two channel hydraulic control unit which, through servo valves regulates the pressure to the braking system, activating the ABS at the moment in which the wheel tends to lock up. The final result is total and constant grip for the tyres, with a consequent decrease in the braking distance. 2-year unlimited-mileage warranty. *Limits are outlined in the warranty booklet. See dealer for details. 1 Free Year of Road Side Assistance provided by Road Canada or Road America. The sophisticated look, aggressive and elegant aesthetics is the focus of all the experience and state of the art technology of the Piaggio Group, offers detailed special finishes characterised by an elegant and common titanium grey colour variant. With this finish is in fact the rear rack, the frame of the equipment, the protection of the tailpipe, the moldings of the central tunnel, in addition to the protection of the fork legs. This makes the combination of the titanium grey finishings with the body colours appear particularly attractive and aggressive. In each of the colour variations available the new Beverly SportTouring features a seat of different colours: Nero Galassia and Argento Cometa Opaco feature a red seat; Bianco Stella and Nero Carbonio Opaco come with a black saddle. The SportTouring version shares the spacious helmet compartment with the entire Beverly range: featuring a courtesy light, it is one of the largest in the category and can hold two full jet or one flip up helmet, in addition to documents, for which a dedicated space is provided. The already sizeable load capacity is complemented by the practical luggage rack, with integrated passenger grab handles, the match coloured glove box incorporated in the leg shield back plate and the retractable bag hook. The finishings are also well detailed: the black saddle has visible sporty stitching; the red saddle, instead, features elegant grey stitching. Beverly SportTouring was the first scooter in the world to be available with a pairing of advanced and sophisticated electronic control systems such as ABS anti-locking braking system and traction control ASR, which prevents skidding of the rear wheel acceleration, both essential to travel safely even in the worst weather conditions or slippery asphalt. 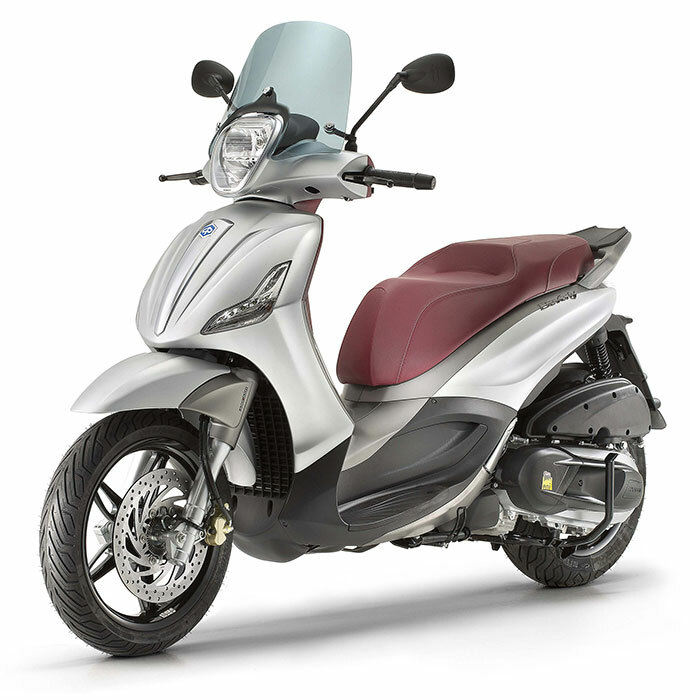 The Beverly SportTouring is by the brand new single cylinder 350, 4 stroke, 4 valve, electronic injection and water cooled engine – state of the art Piaggio Group technology in scooter engines. This is an engine designed to provide performance comparable to a 400 cc engine, but with compact dimensions and reduced weight in line with a 300 cc engine. The first and only motor scooter to adopt a multi plate wet clutch, automatic derivation of the motorcycle, which ensures better performance and constant over time, even under high thermal stress, eliminating the typical strutting of common transmissions from stationary position, whilst also ensuring an extraordinary driving experience in both sporting and suppleness. The performance is outstanding in comparison with excellent fuel economy: 33.3 HP of maximum power and 32.3 Nm of maximum torque, at 30 km/l fuel consumption (for the WMTC cycle). 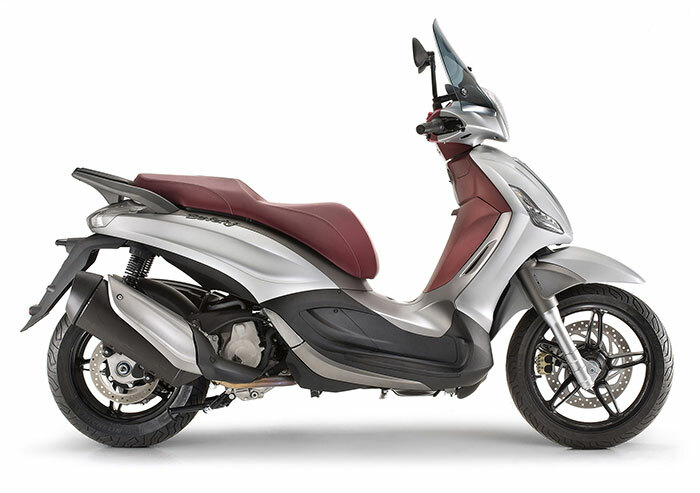 Specs that place the Piaggio Beverly SportTouring al the top of the category. The brilliant engine performance is associated with extremely efficient mechanics, guarantee of agility, efficacy and driving pleasure without compare. The double cradle frame in steel tubing and reinforced with pressed steel, adopts a traditional fork with 35 mm stanchions in diameter, while a pair of double acting shock absorbers and coil spring with preload adjustable to 4 positions work at the rear axle. Beverly SportTouring guarantees excellent road handling also thanks to the large wheels with lightweight alloy rims (featuring 5 split spokes (16″ front and 14″ rear) and its tyres of generous dimension(respectively 110/70 and 150/70). Beverly SportTouring has a dedicated line of accessories which enhance its practicality and versatility in everyday use, such as the top box- matching the vehicle colour – with a comfort backrest matching the saddle colour, the windshield and top fairing, the leg cover, the vehicle cover, the electronic and the saddle-handlebar anti-theft device The helmets of the PJ line, which stand out for the innovative design of the shell, the exclusive side fixings, the large protective visor and the breathable, removable and washable interior are also available for the Beverly SportTouring. The PJ range of helmets has two configurations: PJ with dual visor (normal and sunscreen) and PJ1 with recessed sunscreen visor.